Much-loved digital print and design business MOO recently returned to EC1, just 500m from where the business started 10 years ago. Trifle were thrilled to return to our long-established role as design consultant for the exciting project of creating a new 3065sqm workspace in collaboration with MOO and D&B company, Peldon Rose. 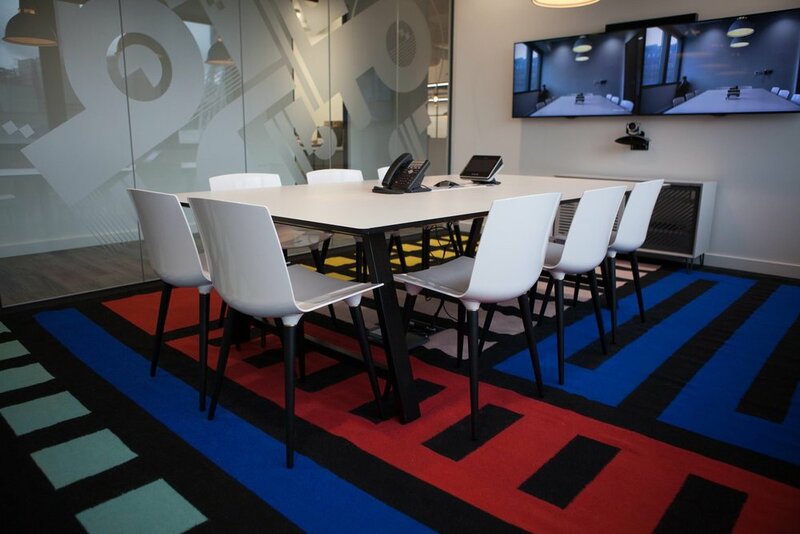 The 13 meeting rooms were conceptualised by the MOO creative team, each relating to a favourite font and Trifle turned this into fully designed rooms. Other features include a stunning bespoke concrete reception desk; beautiful bespoke rugs including one from Camille Walala for FLOOR_STORY, 25 styles of lighting and a central 60m ceiling mounted ’spine’ created from 500 panels of Colour Plan paper. This project was carried out in collaboration with Peldron Rose.